Fellow West Austinites, it has been a pleasure to serve as the President of the West Austin Neighborhood Group for the last four years. During that time, I have written more than forty President’s Messages to members and, of course, several annual messages. One of the recurring themes in my messages has been that we should consider ourselves fortunate not only to live in a fabulous city but in one of its most outstanding neighborhoods. InWest Austin, we are located in and surrounded by a great deal of natural and cultivated beauty. Our homes, businesses and environs are clean and well maintained. We have wonderful parks enhanced by tremendous neighborhood volunteers. Our citizenry is actively engaged in theAustincommunity and in our neighborhood institutions. We contribute our time, talent and treasure to improving the world around us and beyond. Values may differ but there is the continuity of a great sense of pride inWest Austin. Truly, what a great place to live. The West Austin Neighborhood Group’s mission is to preserve the neighborhood and protect it from deterioration. We are a non-profit organization of neighborhood residents concerned with development, ecology, safety, and many other matters that indirectly and directly affect the quality and character of our neighborhood and the City of Austin. I have often covered these topics over the last four years in my President’s Messages and would direct you to our website, www.WestAustinNG.com, should you have interest in learning more. In order to maintain the quality of life we enjoy inWest Austin, it will require our constant vigilance. Our Board of Directors works tirelessly on many of the issues facing the neighborhood but we need your help and support. Fortunately, in many of you, we have outstanding community partners and over the last few years, I feel that we have strengthened and deepened these relationships. I hope you feel the same. Your ongoing engagement and participation as we move forward together is critical. While my term as President ends, I will continue to serve on the Board and look forward to continuing my service to theWest Austincommunity. As President of the MoPac Neighborhood Associations Coalition, I will continue to work on MoPac related issues as well as transportation issues that affectWest Austin. I will also continue my work with our various neighborhood parks and on certain development and infrastructure issues. I ask that each of you make a commitment to be good stewards of our neighborhood and continue to make it a great place to live, play, work and raise a family. Please join the West Austin Neighborhood Group in that effort. West Austinis fortunate to have good parks and recreational facilities but they wouldn’t be what they are today were it not for the hard work and generosity of Austinites. Austin’s Parks and Recreation Department (PARD) faces ever increasing demands and an aging infrastructure coupled with more and more constrained budgets. The majority of improvements in some of our neighborhood parks date back to the Works Progress Administration of the 1930’s, some 80 years past, while others date toAmerica’s Bicentennial Celebration in 1976, some 36 years ago. Wear and tear coupled with neglect is causing our parks to fall further and further behind expected standards. This is inexcusable. Neglect of our parks isn’t necessarily about resource allocation within PARD but within the City’s General Fund itself. PARD will account for only 6% of the City ofAustin’s 2012-3 General Fund budget. It should be noted that the Austin Police Department alone accounts for 39% of all General Fund expenses and emergency services account for 65% in total. With such a disproportionate amount of the City’s budget allocated to one department and to emergency services in general, it just doesn’t leave much for everything else the City is expected to do. This is not to say that we don’t appreciate our first responders – because we certainly do – but we have high expectations for all aspects of our City. Given the level of use in and support for many of our parks, these expectations are justified. Because PARD is underfunded, more and more of the burden to adequately fund the maintenance and operations of our municipal parks has fallen to support groups like the Friends of Reed Park, Tarrytown Park and Westenfield (and no – it is not West Enfield) Park, among many others. What would happen to our much beloved Ann and Roy Butler Hike and Bike Trail were it not for The Trail Foundation orMayfieldParkand Preserve were it not for the dedication of a handful of community volunteers. Proposition 14 on the November ballot will fund approximately $77 million in park repairs, upgrades and acquisitions versus a defined need of $141 million. While fiscally constrained to help assure the passage of the $385 million bond package, it hardly meets the capital needs of our parks. Assuming it passes, we have been assured that Westenfield Pool will be one of the first Aquatics priorities paid for with bond proceeds. Join your friends and neighbors who work so hard on our parks in supporting this Proposition but don’t let it stop there. Lend a hand, write a check and advocate for improved funding for our parks system that contributes so much toAustin’s high quality of life. We seem to hear a lot about crime in the neighborhood. There is a growing sense of frustration in theWest Austincommunity that the Austin Police Department is nonresponsive to property thefts yet we still are considered to be one of the safest cities in the country. It is true that violent crimes are relatively low but the number of property crimes is staggering. Property crimes are not considered violent yet they violate each of us. Most home burglaries, perhaps startlingly, occur in broad daylight during working hours. On the other hand, burglaries of cars tend to happen in the evening. So let’s look at the numbers by zip code. I have just focused on home burglaries and car break-ins. West Austinprimarily is divided up among 2 police sectors identified as Baker 2 and Baker 4. Baker 2 includes Bryker Woods, Pemberton, Old Enfield, parts of Old West Austin and West Campus. Baker 4 includes all of Tarrytown north to 2222 as well as parts of 360. According to APD, each sector has 7 shifts and 2 patrol officers per shift. Sometimes shifts might overlap so more officers are available. This, to me, was a surprisingly low number of officers given the geographic size of our sectors. Clearly police protection is fairly limited. Congestion, cut-through traffic and speeding have been your most consistent concerns followed by pedestrian safety. As part of the City’s neighborhood planning process, we repeatedly asked the City ofAustinto conduct a traffic study as part of the baseline research we felt was necessary for a well conceived neighborhood plan. They declined. It would have allowed us to look more closely at areas where various forms of mitigation and traffic calming were appropriate. It also would have provided us guidance where infill development may be contemplated so that all could better understand the impact of such development. The chart below gives you some idea of traffic volumes per day right now. Paraphrasing, there is a maxim in transportation planning that says traffic congestion will never be better than it is today. The number of trips per day on MoPac has increased from 39,000 when first built to over 180,000 today. The congestion and cut-through traffic we experience is largely spillover from MoPac andBee Caves Road. As we experience increasing density and increasing growth in our region, that trend will continue as drivers look for alternative routes. There are those who are concerned that the proposed construction of State Highway 45 Southwest connecting the south end of MoPac to IH35 will bring additional traffic onto MoPac further exacerbating congestion. Then, of course, we have infill development within our neighborhood. Larger tracts of land that were once home to single family residences are being replaced with townhome developments and duplexes that, depending on circumstances particular to individual tracts, is perfectly permissible. However, that infill development is contributing to more car trips per day and more on-street parking in our neighborhood. It certainly is a more incremental increase but an increase nonetheless. On August 23, 2012, the Federal Highway Administration gave the Texas Department of Transportation the approval necessary via a “finding of no significant impact” to begin the MoPac Improvement Project. The Central Texas Regional Mobility Authority (CTRMA) is in the process of hiring a company to design and build the project and has identified four finalists. The contractor is expected to be selected by early 2013 and construction is anticipated to begin by mid-2013, less than a year from now. CTRMA will continue its community outreach through the process particularly as construction gets underway. For more information, go to http://www.mopacexpress.com. In August, the Austin City Council approved rules regarding short term rentals. On October 18th, they further watered down already lax policy to encourage even more STRs. We supported owner occupied short term rentals or Type I STRs but opposed commercial short term rentals (CSTR). It’s one thing for homeowners to occasionally rent out their houses to help make ends meet. It is entirely something else to have speculative investors establish commercial motel operations in the middle of our residential neighborhoods. Many cities in theUSand around the world prohibit STR’s. Had the City enforced its own codes, the STR issue would never have arisen in the first place but it turned a blind eye to the problem. Proponents argued that since STRs exist anyway, the City should just legalize this use. From a broader policy perspective, this is an absolutely ridiculous argument. Should we just legalize everything that is a code violation or that is illegal because people do it? While there are those that would argue to the contrary, allowing a commercial use in residential areas cracks the door for other commercial uses thus undermining the very reason for zoning districts. The Council approved regulations that would allow up to 3% of all residential tracts within a census tract to become CSTR’s. West Austinis divided into five census tracts with varying numbers of residential tracts. Note the map. Apartments and condominium communities would be exempted thus paving the way for “mini-hotels” while reducing housing stock for long term tenants and residential occupants. We have yet to do an analysis of the impact on the area but expect to do soon. Regrettably, the Council did nothing to prevent clustering of CSTR’s near each other. Recommendations included a 1,000 foot minimum separation between them but that very reasonable item was defeated. They also came up with no solutions on how to deal with census tracts that already have in excess of 3% CSTR’s. Based on the number of CSTR’s, Barton Hills andTravisHeightsmight be the first cases of the City’s willingness to enforce new rules. We are, at the very least, disappointed with the five members of the City Council who bowed to the pressure of CSTR advocates despite overwhelming opposition from the community. We will watch them carefully to make sure that they aren’t lax in enforcement again. If you are concerned about the possibility of CSTR’s creeping into your subdivision inWest Austin, look CAREFULLY at your DEED RESTRICTIONS or restrictive covenants. There are over 250 legal subdivisions inWest Austin. Some prohibit commercial uses or have language defining acceptable uses such as residential only. I am grateful mine do. If you do have language, let those in your subdivision know. If you fail to enforce deed restrictions, they may be deemed waived and thus unenforceable. Neither we nor the City may enforce deed restrictions. It is up to you as neighbors to do so. Note that you can add restrictive covenants or deed restrictions if those in your subdivisions feel that it is warranted. It is worth noting that both Type I and II STR’s need to be registered with the City and that folks living within 100 feet of either must be notified of their registration for the STR’s to operate legally. Call either 311 or 911 if you identify a violation. For a couple of years, it seemed that we had a bit of a respite from development pressures. With demand rising and capitol markets improving,West Austinis once again an active target for redevelopment. It seems that more than 100 properties are on the market at any one time. Some housing stock will be demolished while some will be extensively remodeled. We haven’t tracked remodeling permits but it is worth nothing that there are more than 40 to 45 demolitions per year in 78703. We often get calls regarding both remodels and new construction, typically when there have been problems. We are certainly happy to provide guidance and even facilitate communications if need be. If there are code violations, we typically investigate further and respond or act appropriately. Given the vast amount of construction going on inWest Austin, it is important to note that we are involved in very little, relatively speaking. For instance, as long as no variance from the Land Development Code is sought by an owner or developer and there are no code violations, we are not involved. I would note that our monthly caseload has gratefully not increased despite increasing construction activity inWest Austin. Last year, we held a wildly successful social on Bowman with food from PTerry’s. This year, we are taking a slightly different tack. We will have a brief annual meeting at the Lions Municipal Clubhouse on Monday, November 5 at 7:00PM. We want to use this opportunity to learn more about your concerns for the neighborhood and its future. Here we find ourselves in the “dog days” of summer. And that is not fair to dogs! After all, we love our dogs don’t we….. To err on the side of inclusion, I should suggest that we love our pets of choice. Until the rains of this past week, we had gone a month without rain and the glimmer of hope that was Hurricane Ernesto headed into Mexico. Temperatures have been hovering around 100 for several weeks now. After last year’s record setting summer, you like I probably look at the nightly weather forecast with a sense of dread and hope. Do your eyes drift like mine do to the satellite view of the Gulf of Mexico searching for signs of the development of a low pressure trough that could turn into a tropical storm? Well, let’s hold out hope for more rain and cooler temperatures. Absent rain, do not forget to adequately water your trees. Last year’s stress was devastating for our urban trees. They add value to our properties, help reduce our cooling costs and clean our air in addition to many other benefits. Now when I was a kid, we would begin two-a-day training for football season right about now. I remember it being so hot at Austin High that the heat would sear through my cleats making my feet feel like they were on fire. It was absolutely miserable – but I wouldn’t trade a single moment of the experience or the friendships I made, many of which are still strong years later. We had one water break between sessions from a T shaped spigot on the field and we had to keep our helmets on at all times. Practices ended with the dispensing of a salt tablet. I like to think we were tougher than kids today. The UIL now has an acclimation period of a few days so kids can adjust to the heat before transitioning to full pads. We didn’t get an acclimation period. It is indicative of two things, one a much better understanding of the effects of heat stress and the other, a reflection on how our society has changed. Our next meeting is Monday, September 10 at 7:00PM at Howson Library. We look forward to seeing you! Please join us. In years past, we had a floating dues schedule. Your year of membership began when your payment was accepted. The Board has decided to move towards a fixed date to streamline management of the membership and to make it easier for you to remember when your membership is set to renew. From this point forward, dues will be due on November 1 annually. This year, those who have renewed between July 1 and November 1 will be paid through 2013. Those who renewed prior to July 1 will need to renew on or before November 1 to be active. If you do have questions about your membership, please contact membership@westaustinng.com. We are constantly working on outreach and membership development. Joe Bennett, our illustrious Membership Chair, welcomes your comments and offers. We have the Annual Meeting and Social – ON OCTOBER 27TH – and we would love for you to lend a hand. I hope you will think about it and find a place in the organization. A couple of weeks ago, the Austin City Council approved rules regarding short term rentals. As you know, WANG supported owner occupied short term rentals but opposed commercial short term rentals (CSTR). For homeowners, renting out their homes periodically can help them make ends meet and bear Austin’s escalating cost of living. CSTR’s are simply commercial ventures. By prohibiting CSTR’s, the Council would NOT have prevented investors from making money on their properties. They could have continued to rent them out to tenants via longer term leases. Certainly, long term leases can be more stable than STR’s depending on the property and the investor’s ability to manage it or lack thereof. Had the City enforced its own codes, the STR issue would never have arisen in the first place. But they failed miserably by turning a blind eye to the problem. Proponents argued that since CSTR’s exist anyway, the City should just legalize this use. From a broader policy perspective, this is an absolutely asinine argument. Should we just legalize everything that is a code violation or that is illegal because people do it? While there are those that would argue to the contrary, allowing a commercial use in residential areas cracks the door for other commercial uses thus undermining the very reason for zoning districts. The Council approved regulations that would allow up to 3% of all residential tracts within a census tract to become CSTR’s. 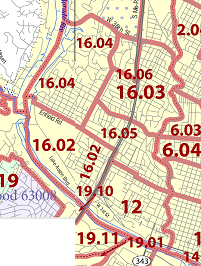 West Austin is divided into five census tracts with varying numbers of residential tracts. Note the map. Apartments and condominium communities would be exempted thus paving the way for “mini-hotels” while reducing housing stock for long term tenants and residential occupants. We have yet to do an analysis of the impact on the WANG area but expect to do that over the next month. Regrettably, the Council did nothing to prevent clustering of CSTR’s near each other. Recommendations included a 1,000 foot minimum separation between them but that very reasonable item was defeated. They also came up with no solutions on how to deal with census tracts that already have in excess of 3% CSTR’s. Based on the number of CSTR’s, Barton Hills and Travis Heights might be the first cases of the City’s willingness to enforce new rules. We are, at the very least, disappointed with the five members of the City Council who bowed to the pressure of CSTR advocates despite overwhelming opposition from the community. We will watch them carefully to make sure that they aren’t lax in enforcement again. If you are concerned about the possibility of CSTR’s creeping into your subdivision in West Austin, look CAREFULLY at your deed restrictions or restrictive covenants. There are over 250 legal subdivisions in West Austin. Some prohibit commercial uses or have language defining acceptable uses such as residential only. If you do have language, let those in your subdivision know. If you fail to enforce deed restrictions, they may be deemed waived and thus unenforceable. Neither the City nor WANG may enforce deed restrictions. It is up to you as neighbors to do so. The City Council approved a $385 million bond package for the November ballot. There is good news and bad news here. The good news is that this is the amount that could be approved without raising tax rates. The bad news is that it falls short of our needs even for critical items like infrastructure. I hate taxes – I really do and I like many of you feel that our various governmental entities waste our money on projects that we individually don’t feel have merit. But they have merit to somebody. Those items that have the greatest merit to me are investments in our infrastructure such as our transportation network and our parks, both of which are woefully underfunded. Because of cost overruns at Deep Eddy and the need to reconstruct Bartholomew Pool that is in a high need area, proceeds from the 2006 bond package will not be available to reconstruct Westenfield pool, now around 80 years old and in bad shape. With Deep Eddy restored and Reed Pool about to begin a significant reconstruction, the City had to make some difficult decisions about allocating remaining 2006 funds. All is not lost though. Instead, we will be relying on several million dollars of parks bonds that are in the upcoming package. We have received assurances from PARD staff that should the bonds pass, Westenfield Pool will be rebuilt in time for the 2014 swimming season. Remember that most of our children are headed back to school on August 27th. According to KXAN, drivers caught texting or talking in Austin pay, on average, the highest fines in Central Texas–$326. Distracted driving was so bad during the 2010 school year that Austin police issued nearly 1,800 tickets. So put the cell phone down, put your coffee in the coffee holder, pay attention at crosswalks and keep an eye out for all those kiddos! What a Fourth of July Parade we had this year! I hope each of you got to attend and enjoy the festivities. It truly is such a wonderful neighborhood tradition. Already the largest in town according to APD, it was made even more memorable with the participation of the Texas National Guard. The Parade was led by a Navy color guard. Participating in the parade were a number of Guardsmen, several Willy’s Jeeps escorted by men in World War II gear, a World War Two era fire truck that had been restored and a Humvee. The Grand Marshal for the Parade was, most appropriately, Frank Denius. Many of you know of his distinguished service but I will recount the two most well know incidents from the Battle of Mortain and the Battle of the Bulge for which he received two of his four Silver Stars. Sergeant Denius and his small group ……directed artillery fire from their vulnerable post (at one point) for seventy-two hours without rest…… despite intense……direct fire from tanks, and artillery and small arms fire directed on their position……by paratroopers, considerable armor, and large infantry forces ……which was a contributing factor in (the defeat of) the German effort. In later combat, when the 30th Infantry Division was fighting in Belgium during the Battle of the Bulge, his Forward Observer party was again supporting the infantry battalion. On December 22, 1944 they found themselves in the path of a German panzer attack. Their artillery observation post was discovered by the enemy and taken under fire by German tanks. Despite the fire that began to fall all around him, Sergeant Denius refused to withdraw from the post and continued “rendering artillery support” until the attack had been repulsed. And if you ever wonder why we celebrate Independence Day, Memorial Day and Veterans Day….. Without the service of folks like Frank Denius, we wouldn’t. 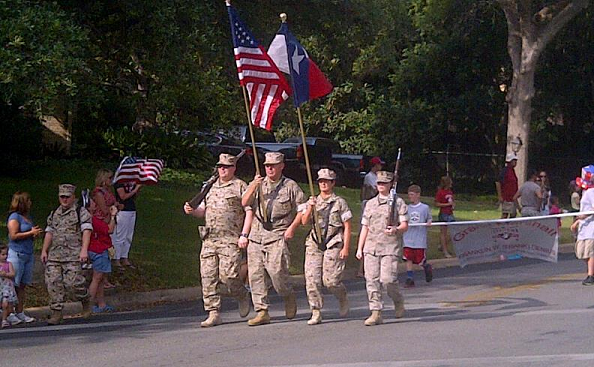 Our neighbors at Camp Mabry really enjoyed being a part of the Parade and look forward to participating in the future! We’re so glad to have them. Planning is already underway for next year’s Parade – perhaps a dance team and the Austin High Band? And speaking of Camp Mabry, you know how I like to segue things. Our good neighbors to the north are concerned about the future of the TxDOT/State Cemetery Annex land at 45th and Bull Creek near Westminster Manor. They may be facing the same sort of challenges we have had with the Brackenridge Tract and the Austin State Assisted Living Center tract. The State and its various agencies have underutilized real estate in most if not all municipalities and counties throughout the State. Frankly, some of it really might be better returned to the public for development or redevelopment. Both the General Land Office and the Texas Facilities Commission are actively reviewing the State’s holdings looking for ways to increase revenue and decrease holding and operating costs, something that is supportable prima facie. The General Land Office seems more interested in selling underutilized or surplus land while the Texas Facilities Commission seems to prefer redevelopment under long term ground leases. Elm Terrace is representative of the former while the Triangle and Central Market are representative of the latter. The activities of both the General Land Office and the Texas Facilities Commission will require monitoring as they are becoming increasingly active. We obviously have tracts of land within the WANG area that could be impacted. Our adjacent neighborhoods certainly do. Our concerns in the neighborhood typically center on land use, compatibility and traffic impact. The last thing we want is a State agency or Legislators that have no ties to our neighborhood deciding what they want without knowing or taking into account what we are willing to accept and what our neighborhood can reasonably bear. The State should be required to comply with its host communities’ land development codes. Those codes have been developed around each community’s values, characteristics and traditions and those should be respected. We have seen how the University of Texas and the System view their assets. The City and UT have agreed to disagree on whether the Brackenridge Tract is subject to local codes and ordinances. The University’s position that it should be exempt is not acceptable. Unfortunately, it may take legislative action to guarantee appropriate redevelopment. The State has created a Partnership Advisory Commission to review the State’s public private partnerships or “P3’s.” It is comprised of appointed Legislators. Senate Bill 1048 was enacted to create the authority and processes governing P3’s and to ensure an open process. It addresses the identification of such projects as well as the contractual requirements between the parties involved. The Partnership Advisory Commission would review the interim and comprehensive agreement proposal before the participating government agency can begin negotiations. Projects under $5 million are not subject to this review if they have already received legislative approval. If you think projects will get mired down forever in bureaucracy, think again. The Commission has 10 days to decide whether it will review a P3 once it has been submitted and the must have a recommendation within 45 days of receipt. Failure to act within that timeframe would constitute a rejection. Lastly, the participating state entity must submit the final agreement 30 days prior to execution for review. This Commission may warrant particular scrutiny as we monitor our State owned lands. I was blown away when I heard that we had lost nearly 6 million trees statewide as a result of drought, disease and fire and that if that loss continued at the same pace, the State would be deforested within 10 years. That is absolutely terrifying. In past newsletters, I have certainly encouraged folks to diversify their own urban canopies. It is no longer about diversifying but about repopulating trees in our neighborhoods and throughout our communities. With that, the following comes from the City of Austin. Connect to the Roots of Your Community. Become an Urban Forest Steward! The City of Austin Urban Forestry program and TreeFolks present the Urban Forest Steward series of workshops focused on building and protecting the urban canopy of Central Texas. Drought, invasive species and habitat degradation constantly take a toll on Austin’s parks and natural areas. The Texas Forest Service estimates that Texas has lost up to 10 percent of its trees. The goal of the Urban Forest Steward series is to equip a cadre of citizens to help us gain ground in rebuilding our urban forest through education and volunteer leadership. Join a Posse and Roundup some trees! Our next meeting is Monday, August 6th at 7:00PM at Howson Library. We look forward to seeing you! Please join us. And speaking of joining us…. WANG has committed to more than double its membership and we need YOUR help. Please don’t forget to renew your membership and encourage your friends and neighbors to join! You may renew at www.WestAustinNG.com. For your convenience, we have enabled recurring billing that will automatically charge your credit card on an annual basis so that you don’t have to worry about your membership status. If you do have questions about your membership, please contact membership@westaustinng.com. We are constantly working on outreach and membership development. Joe Bennett, our illustrious Membership Chair, welcomes your comments and offers. This month, I am going to change things up a bit. Our next meeting is Monday, July 2 at 7:00PM at Howson Library. We look forward to seeing you! Please join us. And speaking of joining us…. Well, guess what. We love to see your smiling faces at our meetings. We want you as Members, and participating Members at that. We need to hear your voices, thoughts and concerns. We sit here month after month working on a host of different issues, big and small, that affect the greater neighborhood. We carefully weigh and deliberate our actions and our advocacy. We don’t and can’t operate in a vacuum so it is imperative that you let us know what is on your mind. We get calls on a regular basis from non-member residents asking for assistance with one issue or another but rarely do we hear from our Members. So what say you! We have not had a robust committee structure over the years but we would like to find ways for you to engage. We have several standing committees, notably Membership, Communication and Transportation, that would be perfect for some of you. Hot areas of interest for the neighborhood also include Crime and Safety, Parks, and the Brackenridge Tract. We have the Annual Meeting and Social – ON OCTOBER 27TH – and we would love for you to lend a hand. I hope you will think about it and find a place in the organization. Our neighborhood needs committed volunteers. We hope you will be one today and in the future. Over the years the West Austin Neighborhood Group has encouraged the creation of neighborhood watches and to raise awareness about best practices. One of the best ways to increase awareness in our neighborhoods is by getting to know one another. The Tarrytown Fourth of July Parade, one of the biggest in Austin, is a splendid way for us to meet our neighbors. And you know what, it is just about the biggest darn community event that we have in West Austin! Department and for the first time, we will have the participation of the Texas National Guard!!!! For more information including sponsorship opportunities and float registration, contact Drew Tate at drew@tateproperty.com. The Fourth of July will be here before you know it. Contact Drew right away. Recently, the media, including the Austin American Statesman and the local news outlets have done stories on the spike in private wells being drilled in Austin – and primarily West Austin at that. To some extent, it is being portrayed as a haves versus have nots. It is far more complicated than that as I am sure you know. It is an issue of water rights. According to court decisions, property owners have a right to the water under their land. It is an issue of efficiency in that the water, primarily used for irrigation, is not treated nor is it pumped through the City’s water utility system at some expense. It is an issue of cost effectiveness for the property owner with the rising cost of water services in Austin, driven in part by the construction of Water Treatment Plant #4. Payback periods for the costs of drilling a private well can be relatively short especially during the high need months of the summer. It is just plain smart in many ways. But is it sustainable. Perhaps not. Pumping and use could be very difficult to regulate or even monitor. This is a bold statement – but barring a cataclysm, we will never be part of a water conservation district as it requires a legislative mandate. Rather than suggesting municipal regulation, which could result in litigation against the City, the West Austin Neighborhood Group would encourage all those who choose to drill wells follow intelligent irrigation practices. Just because one has an “unlimited” supply of water doesn’t mean that this precious resource should be wasted. There are a host of simple and proven strategies that can be used effectively to efficiently use water. We are disappointed thus far in the compromise approved by the City Council on Short Term Rentals. The vote, as of press time, has only been through first reading and may be amended. Type I properties – those that are occupied by their owners and rented periodically – were never controversial as the majority of stakeholders including WANG actively supported these. More controversial are the Type II properties – those that are held strictly for investment purposes – and located in single family or SF3 zoning districts. The use of Type II properties in SF3 districts for short term rentals is an illegal use; it is a commercial use. As a part of the compromise, Type II properties are being limited to 3% of dwelling units in any zip code. That is not a small number. In 78703, that would be well in excess of 200 properties. Provisions that required a minimum separation of 1,000 feet between such properties to mitigate the impact on neighbors were stripped away as were requirements for a conditional use permit. This is a disappointing turn of events that may well have an adverse on many neighborhoods as houses are turned into hotels. This is one reason leading cities in the US and abroad have prohibited them. It is ironic that Council supports a “denser urban core” yet this removes housing stock from those who would choose to live in our neighborhoods. A brief review of Travis County traffic saturation counts doesn’t tell the whole story of traffic or congestion in our neighborhood. It is, however, enlightening. 24 hour saturation counts are done periodically at various points throughout the community by the City of Austin and other agencies. The counts are done when school is in session and during the week to get the most accurate representation. Numbers certainly vary on a day to day basis. Folks might choose different routes skewing the count and peak traffic times are not broken out though the data is likely available. Give or take a couple of hundred cars here and there – that can drive you nuts – below are simplified daily counts for a few key streets. For more information, go to http://www.campotexas.org/programs_rd_traffic_counts.php. Residents frequently set their trash and recycling carts too close together, causing operational issues for Austin Resource Recovery collection crews. Carts should be placed 5 feet apart and away from mailboxes, cars and other objects. Please help us spread the word to your neighbors, friends and family. The trucks that collect trash and recycling are equipped with automatic arms that pick up the carts. If carts are set too close together or too close to other objects, the drivers have to get out of their trucks to move the carts so the automatic arm can pick up the cart without bumping into or knocking over anything. The crews can collect materials more safely and efficiently when your recycling cart, trash cart and yard trimmings are placed 5 feet apart from each other and from other objects like parked cars, mailboxes, etc. What if I don’t have room to set my carts 5 feet apart? We understand that some areas won’t allow for this; simply set the carts as far apart as possible. Do not put recycling or yard trimmings in plastic bags. Plastic bags cannot be recycled in Single Stream Recycling and cannot be composted with yard trimmings. Extra bags of trash that do not fit in your trash cart with the lid closed must be placed next to the trash cart and tagged with an Extra Trash Sticker, which can be purchased at most local grocery stores ($4 + tax). Extra bags without a sticker will be charged a per-bag fee of $8 + tax. For more information, visit austinrecycles.com. Happy May Neighbors! What a great spring it has been. We have gotten ample rainfall and everything is lush and green. Our creeks our flowing and everything seems filled with life. I took the snapshot below a couple of years ago at this time of year and thought I would share it with you. The good news is that Reed Pool is NOT on the pool closure list. In fact, there wasn’t one this year so we have made an impact. There are no programming cutbacks either. However, long term sustainability for pool operations is still a major hurdle. Most of our neighborhood pools operate free of charge while district and metropolitan pools like Deep Eddy and Barton Springs charge a very nominal fee. With the strains on City coffers, we face some real challenges in the years ahead to make sure that all of our Austin neighbors have convenient access to public pools. There are improvements ahead for Reed Pool. In 2005, Austin Water Utility (AWU) installed a new sewer line through Reed Park. In order to provide mitigation, AWU agreed to provide mitigation funding to help renovate Reed pool. However, the funding was never transferred to PARD. PARD and AWU eventually agreed that AWU would provide $87,746 in mitigation funding to help perform work at Reed pool. The funding was transferred in fiscal year 2012 but will not be available to utilize until fiscal year 2013 according to City staff. They added that PARD’s Aquatics Division has scheduled renovations to begin in the spring of 2013 prior to opening the pool for its summer season. The goal of the renovation project at Reed pool is to tie in the gutter system to a serge tank in order to create a closed circulation system. Currently, the gutter system is plumbed to the creek and does not allow for a closed system thus allowing chemically treated pool water to spill into the creek. The total cost of this project to date is $175,000.00. The mitigation money from AWU will be applied to this project along with 2006 bond fund to supplement the remaining amount. The renovations of the pool systems should lower the cost of its operation. As you know, Westenfield Pool will be completely rebuilt after this swimming season and a major overhaul of Deep Eddy has been completed. In other pool news, Reed and Westenfield Pools will open on June 4th and close far too early on August 17th. Splash pads opened May 19th and will close on September 9th. For those concerned, PARD will return the port-o-potty to Reed Park shortly to meet the needs of our busy park. Truly a highlight to end my discussion of the pools…..
Crime, crime, crime. We seem to hear a lot about that in the neighborhood. There is a growing sense of frustration in the West Austin community that the Austin Police Department is nonresponsive to property thefts yet we still are considered to be one of the safest cities in the country. It is true that violent crimes are relatively low. But property crimes are not considered violent. And the number of property crimes are staggering. Yet these property crimes violate each of us either because we or a neighbor are victims. I have been a victim 4 times in the last decade and only once even received a follow-up call from APD upon reporting the theft. Now of course, I always dutifully report crimes because I know we need statistics to justify any requests that we might make. That said, statistics show that APD has an incredibly low rate of solving any of these property crimes. For the sake of perspective, compared to other parts of inner Austin, we are fractional in terms of aggregate property crimes. Most home burglaries are, perhaps startlingly, happening in broad daylight during working hours. On the other hand, burglaries of cars tend to happen in the evening. So let’s look at the numbers by zip code. I have just focused on home burglaries and car break-ins. West Austin is divided up primarily among 2 police sectors identified as Baker 2 and Baker 4. Baker 2’s APD District Representative is Officer William Harvey (512)-974-8123. It includes Bryker Woods, Pemberton, Old Enfield, parts of Old West Austin and West Campus. Baker 4’s APD District Representative is Officer Darrell Grayson (512)-974-5242. It includes all of Tarrytown north to 2222 as well as parts of 360. Each sector has 7 shifts and 2 patrol officers per shift. Sometimes shifts might overlap so more officers are available. This, to me, was a surprisingly low number of officers given the geographic size of our sectors. Patrol officers are supplemented by officers from specialty units like burglary, auto theft, domestic violence and narcotics as needed. As burglary is a significant concern of West Austinites, note that APD’s Burglary Unit is comprised of a Sergeant, 8 Detectives, an Administrative Specialist and a Crime Analyst who is shared with the Auto Theft Unit. You need only look at the numbers above to see how overwhelmed they are. I suspect it is not necessarily that there is insufficient manpower but perhaps it is more a function of how those resources are allocated or utilized. It also may be reflective of how our society has changed that we now have to cope with things like gangs, narcotics, career criminals etc. It is important to recognize before suggesting that we need an increase in the size of the police force that APD eats up 96% of all ad valorem taxes paid and is getting more and more of our scarce tax dollars every year. In June, the Austin City Council will receive the recommendations from the Bond Election Advisory Committee (BEAC) in advance of November’s bond election. As I have mentioned before, the City can maintain the same tax rate relative to debt service by authorizing up to $400 million in bonds. As one neighbor astutely pointed out, if they issued fewer bonds, the tax rate could go down. Unfortunately all that does is bump even more problems down the road. On the other hand, wouldn’t it be nice if we could get everything that needed fixing repaired and improvements done now! Alas, there is neither the capacity nor the will. In advance of the BEAC meetings, City staff went through the process of determining a capital needs assessment department by department for projects that could be undertaken within 5 to 7 years. The Council issued a series of guiding principles to assist staff in their evaluation. Those fell into broader categories including infrastructure, new initiatives, mobility, sustainability, cost effectiveness and balance. Under these constraints, staff identified $1.493 billion in projects. They and BEAC continued and continue to whittle the numbers down through a very painful process and have been instructed to get to $400 million. For the latest updates, go to www.austintexas.gov/department/bond-development. You may send your support, concerns and comments to bonddevelopment@austintexas.gov. We would certainly like to hear from you as well. As most of you know, I also currently serve as president of the MoPac Neighborhood Associations Coalition (MoNAC), a federation of neighborhoods adjacent to MoPac. The next critical hearing for the MoPac Improvement Project was May 23 at O.Henry. This was for the benefit of the Federal Highway Administration. MoNAC supports the Preferred Alternative that is being recommended as it meets the goals and objectives first established by MoNAC. MoNAC’s three overriding objectives were the installation of sound walls, the prohibition of elevated lanes and no taking of additional private property for right-of-way. These essentially all were achieved through the Preferred Alternative. As noted before, some got sound walls who didn’t want them and others didn’t get sound walls who really did want them. But for the most part, the adjacent neighborhoods will be getting sound walls. That determination was made during a very lengthy public process. Except for one flyover to connect to 5th Street, which will only be used for extraordinary circumstances for the time being, there are no elevated lanes included in the Preferred Alternative. Lastly, barring some unexpected engineering complication regarding the placement of the footings for a portion of the sound wall, there will be no additional taking of right of way from private property owners. Each neighborhood has its own unique concerns. The Preferred Alternative answers many of them, perhaps most, but certainly not all and that is recognized. Our north/south corridors – Hartford, Jefferson, Harris, Exposition, Pecos are being used as MoPac bypasses by increasing numbers of cars looking for alternative routes. While the Preferred Alternative doesn’t remove those cars from our neighborhood streets, the express lanes may encourage some drivers to remain on MoPac and perhaps give the impression to others that traffic is moving. The MoPac Improvement Project, after all, is about mobility. Bike/ped enhancements are certainly part of a multimodal transportation solution as is mass transit. It is required that funding be allocated for such projects. To that end, we support a bike/ped shared use path in the MoPac corridor from Parmer to 2222 but not from 2222 south to the Johnson Creek trailhead at Enfield for a host of reasons, not the least of which is the narrow width of that part of the corridor coupled with all of the on and off ramps. We also support east/west bike/ped enhancements at certain MoPac crossings. I have been reminded that many bicycle advocates want to see the MoPac Improvement Project completed with or without this shared use path the length of the corridor. Furthermore, I have been assured by folks involved in the Project that their desire to have this continuous bike/ped route should not interfere with the project going forward. I think of your friends and neighbors who have worked for years and years with several TxDOT régimes and through a few governmental cultural shifts to fight for these protections for our neighborhoods. MoPac or Loop 1 for those who haven’t been around long enough to remember the blue livery of Missouri Pacific trains running through the corridor has gone from a very pleasant drive to a parking lot in 20 years. When it opened, it carried 39,000 cars a day. Now it carries 180,000 cars a day as Austin has continued to grow and as MoPac has been extended. Were it not for those who fought so hard and worked tirelessly for years on this issue, we might have a far less desirable outcome. MoNAC’s objectives are within sight. Please join us in supporting the Preferred Alternative for the MoPac Improvement Project. Our next meeting is Monday, June 4 at 7:00PM at Howson Library. We look forward to seeing you! Please join us. And speaking of joining us…. WANG has committed to more than double its membership and we need YOUR help. Please don’t forget to renew your membership and encourage your friends and neighbors to join! You may renew at www.WestAustinNG.com. For your convenience, we have enabled recurring billing that will automatically charge your credit card on an annual basis so that you don’t have to worry about your membership status. If you do have questions about your membership, please contact membership@westaustinng.com. I just said farewell to my nephews and family who live in New York City. It is always sad to see them off. Of course, I work on “persuading” them to move back to Austin every chance I get! As I have no children of my own, it is such a treat to be Uncle Hap. I often think about their experience here and as all adults, compare it to my childhood. We ran around the neighborhood, unfettered by many of the restrictions, complications and concerns faced by the community today. Of course, my Dad used to wax nostalgic about picking berries along the railroad track and one of my uncles used to take his horse into the woods to go hunting in what is now Tarrytown. We didn’t need cell phones and certainly didn’t have all the electronic gadgets that kids today obsess over. We had our regular hang outs – Holiday House being at our near the top of the list. Our good neighbor, Maudie’s, is probably the closest comparison for this generation but it is not exactly considered walkable unless you live south of Enfield. In my neck of the woods, we had the 7-11 on Jefferson, Winn’s, Baskin Robbins and a few other regular spots – also now all gone. What strikes me is that there is a real dearth of gathering spots for the kids in West Austin and frankly for the adults unless you are a member of one of the private clubs. Texanza recently closed on Windsor though Austin Java is expected to take over their space in the Tarrytown Shopping Center. A coffee shop only gets us so far. I think we all hope and pray that Jeanne Daniels sells the Center but I am afraid that is wishful thinking given her history since inheriting it. There will come a time in the next few years that some or all of the Brackenridge Tract is redeveloped. I have no doubt that we will have some new hotspots and places to create new memories. It is always possible that we will see similar opportunities pop up around the Austin State Assisted Living Center in time as well. It strikes me that the last time the northern end of Tarrytown had any commercial enterprise of note was when there was a Utotem at Pecos and West 35th. Now before folks get all jumpy, I am neither inferring that the Austin State Assisted Living Center is under consideration for redevelopment nor that I am advocating for it. I do think there is a scenario that would benefit the Center, its clients and employees, as well as the neighborhood. Perhaps one day we’ll have that discussion. As I had mentioned in a prior President’s message, very little in the upcoming bond package will impact West Austin. You can get more information on the Needs Assement that is the underlying document for whatever bond package is ultimately presented to the voters. For more information go to: http://www.austintexas.gov/sites/default/files/files/Capital_Planning/Needs_Assessment_Projects_and_Programs_Report.pdf. Council will receive a final report and recommendation in May so your input now is critical. You may send your support, concerns and comments to bonddevelopment@austintexas.gov. We would certainly like to hear from you as well. There is $750,000 allocated for Eilers Park presumably to move forward with the brilliant masterplan that has been idled waiting for funds. There is no assurance that this will make the final package so it is important that you let both the Bond Advisory Committee and Council know that it is important to you and to West Austin. There are two other bond initiatives that do affect West Austin and the West Austin Neighborhood Group has publically opposed both. The first is Item 9684.003 that will fund the replacement of Emmett Shelton Bridge on Red Bud Trail at a cost of $18,630,000. It is anticipated that it will be an elevated bridge that will cross at a higher point on either end. One person compared it to the new bridge now circumventing Mansfield Dam. A new bridge will only serve to encourage the diversion of even more traffic from Loop 1 onto adjacent neighborhood streets never designed nor intended for current much less anticipated volumes of traffic. Furthermore, a less costly option may exist. Rather than reconstructing the Emmett Shelton Bridge, we suggest that the City consider reinforcing the existing structure. We recognize a study by Faulkner Engineering that stated that the Bridge has no remaining fatigue life. However, reinforcement would meet health and safety requirements and extend the life of the Bridge without encouraging the diversion of additional traffic. While we generally support initiatives that will result in improved mobility, noting that this received a mobility score of “0,” this particular project will only serve to decrease mobility as a result of diversions, decrease safety and potentially have an adverse environmental impact. It should be noted that many folks using Red Bud Trail will be doing so to avoid not only Loop 1 but FM 2244, FM 2222 and Loop 360. In doing so, they will utilize roads like Westlake Drive, Redbud Trail etc. within the City of Westlake Hills. These roads simply are not equipped to deal with additional volume that a new bridge would generate. In addition, we oppose specific funding for Red Bud Isle under General Park Improvements for $1,500,000. We typically would be wholeheartedly in support of park improvements but Red Bud Island is unique. The Friends of Red Bud Island under new leadership are actively seeking these funds and WANG has been clear with them about our strident opposition. Below is a photograph from 2007 looking north from the Emmett Shelton Bridge on Red Bud Trail. As you know, this is not uncommon during heavy rains. Here, Red Bud Island is being scoured by this flooding event, not one caused by creeks or streams but the raging torrents of the Colorado River. Every few years, improvements are obliterated by these recurring floods. Any investment in surface infrastructure is a waste of scarce resources. Aside from the futility of infrastructure improvements for Red Bud Island, we oppose increased parking. We have suggested that rather than increasing parking infrastructure, existing parking spaces should be metered to encourage turnover so that more folks have access to the facility. A recently released study supporting our contention on turnover noted that the extended parking meter hours downtown had resulted in higher turnover and improved availability of existing on-street parking. That said, it was intended per the Town Lake Comprehensive Plan that Red Bud Island be kept in its “natural” state, as much as possible and that human activity was to be limited. “It is important to keep some small areas sacrosanct to maintain reminders of the native beauty of the region.” More parking, more infrastructure and more people just don’t coincide with that objective. At last we have an advantage in getting scare highway funding because the managed lane project and its sound walls are considered essentially “shovel ready.” Because the proposed alternative, the managed lane project, must be acted on by June, we have our best opportunity to move forward with this after decades of waiting. Final approvals should come in August. Should all this come to pass, we should have both sound walls and managed lanes in place by 2014. We all hear about folks that are adamantly opposed to tolling. Having chaired the Greater Austin Chamber of Commerce’s Transportation Committee, I have had the opportunity to listen to transportation experts at the local, state and federal level. Some would say I “drank the kool aid” but there is a practical consideration that the average person who opposes tolls doesn’t get. Roads cost an awful lot to build and an awful lot to maintain. There is not now nor will there be again in the foreseeable future federal or state funds available on the enormous scale needed to grow or even maintain our infrastructure. Neither is there the political will at any level. The motor fuels taxes used to pay for both new construction and for maintenance. It has been some time since it was able to keep pace with new construction and now no longer is sufficient to even keep up with growing maintenance requirements. Coupled with increased vehicle fuel efficiency, we are on an unsustainable path to address our infrastructure needs. The last time the motor fuels tax was increased was 21 years ago. And while we can all rejoice every time we go to the pump to fill up, the fact of the matter is that we are deferring an enormous if not insurmountable burden, unless of course we develop Star Trek’s transporter technology. Beam me to work Scotty! I, like each of you, certainly don’t like to pay any more in taxes than necessary. A toll is a voluntary tax as is the motor fuels tax. Essentially, you use it – you pay for it. Some might argue that taxes like these are regressive. I would argue that they are voluntary. But these mechanisms are also the only means we have to pay for the roadnet that we need to have a functioning economy and to some extent a functioning society. Roads are not free and have never been. Tolling will become increasingly common, and essential, in funding both new highway projects and adding capacity on corridors like MoPac. There is page for those of you who use FaceBook that you can find by entering “Tarrytown Fourth of July Parade.” You can also email tarrytownparade@gmail.com for more information. Drew and Misty Tate have volunteered to co-chair the event. We do have some very exciting news. For the FIRST time, the Texas National Guard will be participating in the Tarrytown Fourth of July Parade. Already one of the biggest in the City, this will make our parade even more unique! In addition to a color guard, our parade will include at least 50 members of the Guard and four military vehicles. It will be an honor to have them in the parade as both neighbors and as those we should salute for their ongoing commitment to our community and our country. Our next meeting is Monday, May 7 at 7:00PM at Howson Library. We look forward to seeing you! Please join us. And speaking of joining us…. WANG has traditionally stayed out of the fray of politics and has focused on issues that affect our wonderful neighborhood. Occasionally we will foray into areas of citywide concerns where they impact us. We are always involved in a wide array of issues that affect each of you. We always keep you informed via the monthly newsletter. Another way we communicate is by holding monthly meetings. Our meetings are typically held the first Monday of the month at the Howson Library at 7:00PM. Many of you have never attended a meeting. That is a great disappointment to me and I suspect to other board members. To a great extent, these are held for the neighborhood’s benefit. And more often than not, the only folks attending are those there for a variance request or those with a program presentation or an issue. Like so many other meetings, some of ours can be dull as heck. But there is always something on the agenda of value. After dispensing with the business of the board, we have a section called Neighbor Communications. Typically, this is when presentations are made by various organizations. For instance, this month, we had a presentation by the staff at Camp Mabry regarding an update on their forward-thinking masterplan currently underway and their upcoming American Heroes Celebration on April 21st and 22nd. Last month, we had a presentation by the folks at Good Shepherd regarding the completion of their negotiated site plan and a discussion with the City about the traffic calming project at Tarrytown Park. After presentations are complete, we encourage members and neighbors to bring up issues of concern. This is your chance to let us know what is on your mind so that we can more effectively address any issues. After Neighbor Communications, we move into Zoning to address any land use cases that might be on the agenda. Blake Tollett has served as our Zoning Chair for years and is an irreplaceable asset for our neighborhood. Most commonly, these cases are variance requests. Variances most frequently are required when planned construction exceeds the City’s Land Development Code. No case is ever identical though from time to time there are similarities, and many are quite interesting. Each case is thoughtfully reviewed and deliberated. We consider whether a hardship exists, whether the matter is precedent setting and whether there is any neighbor objection. The City’s Board of Adjustment does not consider financial hardship and thus neither do we. We often do make recommendations to the applicant, owner or builder about options to consider that would bring the project into compliance. Some have been open to our recommendations while, as you might imagine, others have not been. We then vote to oppose, not oppose, or not oppose with negotiated conditions. It is rare when we have a zoning case. With the Neighborhood Plan in place, the Future Land Use Map (FLUM) defines zoning categories within the planning area. This provides owners with guidance on land use decisions and hopefully keeps the number of potential cases at a minimum. Most of our planning area is categorized as single family on the FLUM and most of the zoning within the FLUM category is Single Family 3 or SF-3 which allows for single family residences and duplexes. We have very little commercial property and, for the most part, existing zoning provides for most anticipated neighborhood uses so there really isn’t much of a need for up-zoning. The only cases that occasionally come forward are those that would increase the dwelling units allowed on certain tracts to facilitate denser multifamily projects. We are always careful about allowing the encroachment of either commercial or multifamily uses into existing single family areas. Lastly we move into Committee Reports. This is where you have a chance to learn about infrastructure and park projects, Brackenridge Tract or State School updates, MoPac and other items and issues that affect West Austin. I would like to think these reports are informative. We all have busy lives. I certainly am not chastising you for not attending our meetings. But we would love to see you at our next meeting and share with you and have you reciprocate with us. We also would invite you to be more active and engaged members of the West Austin Neighborhood Group! The City of Austin is currently considering not if but how large a bond package it will place on the November ballot. We urge you to be engaged and knowledgeable about the bond package. Please go to the City’s site http://www.austintexas.gov/department/bond-development for detailed information. For the preliminary capital requests, it is well worth reading http://www.austintexas.gov/sites/default/files/files/Capital_Planning/Needs_Assessment_Projects_and_Programs_Report.pdf . The numbers are staggering but it is important to recognize that this includes all asks under a needs assessment and likely will be pared down to around $400 million. There are those that suggest that the bonds ultimately submitted for voter approval in November will not be more than the current City property tax rate can service. I have said this before but we in 78703 pay about 10% of all ad valorem taxes collected by the City and there is very little of this bond money that impacts our neighborhood. However, much of it does impact the quality of life we enjoy in Austin so it is critical that you have a firm understanding of what will be at stake in November. From February through April the Bond Election Advisory Task Force, comprised of community members, is considering the capital needs assessment project lists and taking input from the public, stakeholders, other City Boards and Commissions. There are four committees established to consider the project and program lists provided by City staff. The committees are Affordable Housing, City Facilities, Parks and Open Space and Transportation/Mobility. If there are bond issues you feel strongly about, do make sure you engage with the appropriate committee. In May, the Task Force will make final recommendations to the Austin City Council. You will then once again have the opportunity to influence the final bond package. If there are any particular bonds that affect West Austin, WANG will review them further and report to you. The City would have you believe that this has been a process full of public input and participation. There certainly have been and continue to be ample opportunities for each of you to weigh in – and you SHOULD! But the fact of the matter is that City planning staff are driving this and have little regard for public input. To compound the matter, staff insisted that the community focus on the “possibilities” without looking at or being provided with critical details on which to make an informed decision. It is easy to move dots around on a map. But you have to know the facts on the ground. Anyone experienced in due diligence or studied in history knows how critical such information is to avoid a flawed if not disastrous outcome. Our own Mary Arnold, with all of her experience and knowledge, has absolutely overwhelmed City staff pointing out in her eloquent way the many flaws in their draft work product. I believe in a plan, that it should be based on facts and data, that it should encompass an understanding of the areas that it will impact, that it should be well thought out, that it should be embraced by the community and that it should be implemented. Austin Tomorrow, its predecessor was such a document –driven by the community and not staff – but few of its recommendations addressing preferred growth corridors were ever implemented despite their value thus resulting in many of the problems we face today. I understand and appreciate the need for a comprehensive plan. For a city of Austin’s size, every step we make must be strategic and thoughtful and a comprehensive plan, if well done, is a critical tool for success. What is being presented for consideration falls far short. Our next meeting is Monday, April 2 at 7:00PM at Howson Library. We look forward to seeing you! Summer but it certainly is welcome. I sincerely hope that this beneficial weather contributes to the recovery and reinvigoration of our invaluable urban tree canopy. hummingbird feeders. By all accounts, we are due for what may be a spectacular showing of bluebonnets this year too and with any luck a good Texas peach crop to follow. As I ramble on, it becomes ever more clear that it is time to prepare those Spring “to do” lists. On sites where construction schedules take precedence, pruning any live tissue should only be done to accommodate required clearance. and helping to maintain it for the benefit of all. Red Bud has morphed from what had been viewed as a preserve as late as the mid 1980’s into a multiuse recreational facility and more recently an off leash dog park, and as such is ill equipped. Overuse, traffic and parking have become enormous challenges for this accidental feature in the middle of the Colorado River. Red Bud was designated as an off leash area in 2001 but is, in fact, a multiuse recreational park and preserve, not merely as a “dog park.” It is unfortunate that this connotation drives other recreational users away and has resulted in a degradation of this environmentally sensitive area. I was quoted in the Austin American Statesman on February 1, 2012 as saying “part of the problem is an island that wasn’t supposed to be there is being used in ways other than originally intended.” Continuing, “it was never intended to be a dog park. It was a park with a nature preserve. In fact, there was some discussion about whether the public should have access at all. longer than 6 feet on all City land. The maximum fine for not following this ordinance is $500. will have. While there are a number of conversations going on, it is critical that we understand what you as West Austinites hope and expect in the coming years from the Brackenridge Tract redevelopment. We will be launching a survey in the next month and hope that each of you will participate. The 2011 (Tarrytown Fourth of July Parade) Committee managed to pull together at the last minute and got the parade organized, permitted, and completed in 10 business days. We didn’t want the 20+ year tradition to lapse. So, who knows what one can do with more notice!! Our next meeting is Monday, March 5 at 7:00PM at Howson Library. We look forward to seeing you! Merry Christmas and a very happy and prosperous 2012 to each and every one of you from the Board of the West Austin Neighborhood Group. A quick drive through the neighborhood let’s everyone know that we truly love this holiday. Every year it is such a delight to see the latest decorations. Let us hope the joy of the season carries us all into the New Year. I recently saw this quote and thought it appropriate: “how we spend our days, of course, is how we spend our lives.” Together, let’s continue to spend our days making West Austin the wonderful neighborhood and community it is. The planning process seems quite similar to the neighborhood planning effort we recently completed. The plan will address all 365 acres of the property, excluding the Reserve Center at the northwest corner, which is Federal property. H.W. Lochner, Inc. will lead the planning process which started with a “data collection” phase this past October, and will proceed through a draft plan presentation (Summer 2012), Revised Plan (September 2012), and Final Plan (Sept. 2012). The project lead is Scott Wetzel. He, Joe Beerens in the Adjutant General’s Department, and base command staff wanted everyone to know that this will be an inclusive process and urged our participation. I had a much better feeling about this than I did either the Brackenridge Tract process or the Central West Austin Combined Neighborhood Planning process. As for the presentation, it was very nice and efficient and “structured” presentation. The materials distributed at the meeting included a listing of “Draft Goals” for an initial framework for the plan, as well as “Draft Policies” which may be refined and supplemented. They intend to include examinations of efficiency, sustainability, historical significance, natural features, in completing this comprehensive study, They gave participants an opportunity to provide comments and input, including the proverbial colored-sticker-on-map exercise. Many suggestions were made by participants including removing the LED scrolling display sign on MoPac, return the main entrance to its original location, realigning the Pecos exit to actually align with Pecos to improve the efficiency and safety of that interchange and to make sure that there is a fire plan in place given the density of brush and its proximity to residences. For further information about this and the National Guard, please go to www.txmf.us. We, of course, will continue to be active participants in this process. You may always direct your thoughts and concerns to us. In years past, Christmas decorations have disappeared from houses and yards, in many cases to be found adorning buildings belonging to certain University of Texas organizations and student abodes. I am just trying to be inclusive here. The folks in Pemberton and Bryker Woods have fallen victim to bad elves more so than Tarrytown as they tend to be closer in proximity to the culprits. We were asked to convey to the Austin Police Department and to University officials that certain neighbors had enough of this naughty behavior and that there would be consequences. I am pleased to say that having discussed the issue with both, we had the full support of both and I have yet to hear of missing Santas and sleighs. While you might not want to mark every colored light bulb, it probably would not be a bad idea to mark those distinctive decorative items in the event that they do find hooves and take flight. In the event that decorations do disappear, both the police and University officials have asked that we provide as much proof as is available. May the bad elves’ stockings be empty in the finest traditions of bah humbug. For those of you who like me are overindulging perhaps a tad during the Holidays and have gained a pound or two or ten, our friends and neighbors at Save Muny have just the cure for you! The Save Muny Run for the Green, a 5k. Run ON Lions Municipal Golf Course, will be held on Sunday morning, February 5, from 8 a.m. until 10 a.m. You can get more information through RunTex http://site.runtex.com/ and at www.savemuny.com. On Sunday, February 19th, you will have another opportunity to purge your system of holiday goodness at the Livestrong Marathon and Half Marathon. For more information, go to http://www.active.com/running/austin-tx/livestrong-austin-marathon-and-half-marathon-2012. We continue to work with Livestrong and other race promoters to insure that the impact of these events has as minimal an impact as possible. I can assure you that over the last few years, coordination between the City of Austin and race promoters has improved significantly. We will continue to have the rolling barricades that will free up intersections much faster. This has proved successful. We have asked that a race representative be placed at major intersections with police officers to assure the highest level of communication between all. WANG is continuing to work on and improve its communications with you. We are in process of enhancing the website. We are also looking at changing the way newsletters arrive to those of you who choose to receive them electronically. Currently they come as Adobe PDF files but we anticipate that these will be converted to HTML format shortly. Please don’t forget to renew your membership! You may renew at www.WestAustinNG.com. For your convenience, we have enabled recurring billing that will automatically charge your credit card on an annual basis so that you don’t have to worry about your membership status. If you do have questions about your membership, please contact membership@westaustinng.com. Our next meeting is Monday, January 9 at 7:00PM at Howson Library. One discussion item will be Good Shepherd Episcopal Church’s review of its current masterplan for those interested. We look forward to seeing you! Have a wonderful and safe holiday season! Cheers! From the Board of the West Austin Neighborhood Group, we wish each of you a grand and a happy Thanksgiving. We are indeed truly blessed to live in a great neighborhood in the heart of a wonderful community. One has but to glance at the New York Times or one of the many news outlets to truly appreciate the enormous economic, social, political and environmental struggles faced by people throughout the world, in much of this country and even in Texas. While we may complain about our many trials and tribulations, and heavens knows I do, few reach the magnitude faced by others and for that alone we can be most grateful. May your travels be safe, your company delightful and your plates filled with deliciousness! A special thanks goes to Mike Cannatti, whose zeal and energy were boundless in organizing WANG’s Annual Social held on Bowman next to the Howson Library. We departed from our typical presentation defined format to more of a purely social event that seemed to be very attractive to all. Celebrating memories of our beloved and long lost Holiday House, it was a cathartic event for many as neighbors recounted their fondest recollections of what was our community gathering spot, an egalitarian place for all generations to mingle. PTerry’s served so many burgers that they had to have their team bring more and actually ran out of French fries. They smelled so good – darn diet! We had one of our largest turnouts in history and I am pleased to report that WANG had a wave of new members and renewals. Could this be the magic formula? My one disappointment was that Howson Library was not open. It is such a rich treasure for our neighborhood. I do hope you have the opportunity to visit the Library from time to time. As always, we would like to hear from you about how we could make the Annual Social better. There has been some press about the Brackenridge Tract at last. According to the Austin American Statesman, The University of Texas System is considering the feasibility of constructing a four to five story building on the portion of the Brackenridge Tract adjacent to Red Bud Trail. This would bring an estimated 500 employees to the area and at least perhaps 1,000 extra car trips per day into the neighborhood. If the System were to make lease payments to the University of Texas, who owns the land, then under the premises set forward by the Board of Regents, it would benefit the University as intended. Absent rent and without some level of transparency regarding the agreement, it is difficult to see how this development might meet the terms of Colonel Brackenridge’s gift that has so often been referred to. That said, perhaps this institutional use, from a neighborhood perspective, is not all bad. Discussions around the formation of a more concrete medical school in Austin led by Senator Kirk Watson are welcome. This has the potential to become a significant economic driver for both Austin and the region. The medical school, while working in collaboration with various UT colleges and departments, will actually be under the University of Texas System umbrella and not under UT Austin. The ideal location, for a variety of reasons, is proximate to campus and to both Level I trauma centers, Brackenridge and Dell Children’s Hospitals. The Brackenridge Tract, while close to campus, is not as well situated as land that UT owns and could redevelop in the Waller Creek corridor. Nonetheless, it does make one ponder the thought that the managing agent of the Brackenridge Tract would relocate its offices to overlook the area. This is a gentle reminder that the Lions Municipal Golf Course and WAYA leases expire in 2019, barely 7 years from now. The closer we get to that date, the less leverage we will have. However, it is imperative that you never believe something is inevitable and that we as a neighborhood can’t effect change. If you aren’t a member of when of the neighborhood Yahoo groups like Tarrytown West or Deep Eddy, I would encourage you to join. WANG has been asked on a number of occasions to set up a neighborhood wide one. It is something that we have considered and taken under advisement. In the meantime, these two offer the opportunity for you to keep up with it seems primarily criminal issues in the neighborhood. We are seeing an ongoing pattern of break-ins, attempted home invasions and car burglaries – even during daylight hours. There have been furtive efforts at organizing neighborhood watches but it takes the time and commitment of neighbors and sadly, there aren’t a whole lot of folks willing to step up. Absent an organized neighborhood watch, I would encourage you to be vigilant and report anything suspicious. I have been asked by folks in Pemberton and Bryker Woods, for which WANG serves as an umbrella organization, to address the issue of stolen decorations, particularly Christmas and Halloween, with the University of Texas and its student organizations. Student organizations have been identified virtually on an annual basis with at least a portion of the theft. In some cases, decorations have been recovered and in other cases, treasured ones have been severely damaged or destroyed. Folks in these neighborhoods are fed up and have threatened civil and criminal action against the perpetrators. The ability to identify the specific criminals or to assess civil damages certainly presents a real challenge but their anger and frustration is certainly understandable. In the coming weeks, I will be meeting with University officials and representatives of the student organizations along with the Austin Police Department. Hopefully we will be able to affect a change for this holiday season and perhaps create a punitive mechanism that will raise awareness at the organizational and student level – because Santa really does know if you’ve been naughty or nice…..
Look at the date on your mailing label to see if your membership is current. While doing so, don’t forget to pass along your preferred email address to us! A growing percentage of WANG members now receive the newsletter via email. We certainly would encourage you to shift from a hard copy of this newsletter to an electronic edition. Don’t forget that your continuing support of WANG is never more critical than now. In addition to paying your dues by check, you can always renew your membership online at www.WestAustinNG.com. I am pleased to report that 2011 has been a relatively quiet year in terms of critical issues facing West Austin. The things neighbors have been most concerned about are traffic congestion, ongoing criminal activity and the effects of our historic drought and concurrent heat wave. While the economy has lessened development pressure on the neighborhood as a whole, it is good to see the construction trades busily working on repairs, improvements and remodels as we revitalize our existing housing stock. Capital markets and perhaps other factors have slowed any redevelopment of the Brackenridge Tract. The State School and for that matter Camp Mabry were spared in the most recent legislative session – though the State continues to look at public private partnerships to leverage all its assets. All that being said, there are a number of citywide issues that may ultimately impact us and are things that you as an active community should be very aware of, notably the Comprehensive Plan and various mobility initiatives. Also pending are the more highly politically charged issues like election schedules, single member districts and short term rentals or STR’s. In addition to serving as President of the West Austin Neighborhood Group, I am pleased to be active in organizations such as the Greater Austin Chamber of Commerce, the Heritage Society of Austin and Leadership Austin. My various roles have enabled me to meet folks throughout the region who are dealing with many of the same issues we are as well as other quite diverse challenges. It is so easy to focus on what is immediately in front of us or what directly affects us, whether that is our neighborhood, our places of worship, our children’s schools, our relationships or our businesses. But we are part of a rapidly growing, and at least for now, a vibrant region. We as a community and a region are not just competing against Houston and Dallas for jobs but against peer cities such as Charlotte, San Diego and the Silicon Valley, Portland, Minneapolis, and Denver et al. We are also in a fight with far flung countries for economic opportunity. What Austin has is unique. It has a vibe that attracts some of the best and brightest from all over the US and the world for that matter. And that is what has made Austin the success it is. But that je ne sais quoi can be ephemeral and fleeting. If we are not good stewards of our natural and built environment, that vibe will be lost and Austin’s future will be much less certain. Austin is a gem because of its outdoor culture and its love of recreational and native greenscape. Town Lake Trail and the Barton Creek Greebelt are perhaps victims of their own success with teaming throngs of walkers, runners, hikers and bikers. Our pools and recreation centers are loved and well used – when they are open. Our immensely popular parks throughout the City have been woefully underfunded as our first responders have taken an ever larger share of total City revenue. More and more, our parks are dependent on public private partnerships and private fundraising efforts to be sustained and improved. We are so fortunate to have groups like Friends of Eilers, Reed, Tarrytown and Mayfield Parks, the Austin Parks Foundation and the Town Lake Trail Foundation. Absent your support and the work of groups like these – and other similar organizations throughout Austin, these gems that are the very heart of our community would be in shambles because of City budget priorities. I was recently in Charlotte, a leading global financial center and certainly a competitor of Austin’s, and I was struck by the fact that it lacked much historic fabric. There are folks in Charlotte that publically recognize that the loss of Charlotte’s built history is a blemish on their city. Urban Charlotte is largely no more than 20 years old. While I thought it had some wonderful commercial architecture, I also felt that it was lacking character and a sense of place and thus seemed very sterile. I have noticed this in other cities that failed to protect their history. As a footnote, until 1974 Austin did an absolutely abysmal job of protecting its built heritage. With the enactment of the Landmark Ordinance in 1974 and then when it was incentivized in 1978, we began the process of protecting what historic fabric we had left, and for the most part, we have been successful. Many of our peer cities used local historic districts, which would serve to offer some protection, to protect broader swaths of their respective communities. In 2004, we added local historic districts as a tool for preservation. Now with more preservation tools available, we may be able to protect more of what is uniquely Austin. I address historic preservation precisely because, much like our parks and open space, our historic fabric gives Austin some of its uniqueness and its sense of place. As we recruit businesses and workers, particularly those in the creative class, they are drawn to places like Austin that have preserved its heritage. Tourists also flock to cities that have retained their character. Heritage tourism is an enormous economic driver for both Austin and the region. There is both a cultural and an economic benefit to historic preservation. Our environment is also what has contributed to our success. Long considered an oasis in Texas, with a wealth of trees, water, clean air and open space, sprawl and inappropriate development have and continue to threaten our long term viability. While a few, but certainly not all, in the development community bristle at regulation, were it not for hard fought restrictions, the damage that we have done to our environment would have been far worse. Sadly, we seemingly have to fight some of these same battles over and over again as some try to weaken regulation that, in aggregate, protects us. This is not to say that development is not good. In fact it is essential for our community’s prosperity. We need to focus development intelligently maximizing transportation infrastructure, respecting open space and our green assets, and integrating in such a way as to not diminish our stable urban neighborhoods. Water has long been one of our greatest assets. Now that Lake Travis is at less than 39% of capacity and with the likelihood of any significant rain dim for perhaps the next 6 months (or 20 years), it has become one of our increasingly scarce resources, particularly with rampant growth in the region. City leadership wisely secured contractual rights to water supplies that will more than adequately provide water for the City, but rights don’t matter much if there isn’t any water! The drought has devastated agriculture and horticulture alike. It may seem a bit trivial in the bigger scheme of things but yards are struggling, to say the least, and our irreplaceable urban tree canopy is in peril. Many of us, even those who irrigate regularly, are incurring thousands of dollars if not tens of thousands of dollars in landscaping losses. The drought has also created an economic debacle in the region. Falling property values around Lake Travis and shuttered or struggling businesses that depend on the “lake” economy may ultimately affect the entire City, if nothing else because of perception. The New York Times and other publications have written of our region’s drought in the news regularly. One of the themes has been about the migration of desertification to the east. This, frankly, is terrifying. My last point in this line of thought is our air quality. Weather patterns, increasing traffic congestion and other environmental factors are edging Central Texas ever closer to non-attainment, meaning that we don’t meet minimum air quality standards. Non-attainment would be very costly to all of us. The simplistic answer, and one that certain politicians espouse, is just to alter the threshold. This fails to address the problem, which is what the current standard was intended to force. There are a host of things that we can do to reduce carbon dioxide emissions – and you are all well aware of what many of those options are. Improved regional mobility is high on the list, both environmentally and economically. This includes an array of transportation options from rail to bus to managed lanes. So what does all of this have to do with West Austin? I used air quality to segue into transportation as they are very much intertwined. TxDOT, the Central Texas Regional Mobility Authority and their consultants have just completed several years worth of studies of the MoPac Corridor. The final package submitted to the Federal Highway Administration will include managed lanes that are intended to move traffic at dependable rates of speed on Loop 1. That is achieved by using variable rate pricing based on traffic volumes and peak times. Central Austin won’t access the managed lanes. However, I hope that it will improve drivers’ perceptions so that they use MoPac rather than Hartford/Jefferson/Harris and Exposition/Pecos – and yes, we now include Pecos as a bypass to MoPac sadly to move north and south. In conjunction with the managed lane project and as a result of the addition of lane capacity, sound walls are at last to be built, barring further changes in Washington. Votes were taken on the sound walls. Only those property owners immediately adjacent were entitled to vote. Walls were approved for all of Tarrytown extending from West 35th all the way south of Enfield. The southern most section of Deep Eddy will not have sound walls because studies showed that they were too far from the noise source. Similarly, Bryker Woods and Pemberton will have sound walls installed but votes were split for three sections in Old West Austin. You can learn more about the process and the vote at http://www.mopacexpress.com/environmental/sound-walls.php. It is hoped that the project will be completed by 2013 provided it receives approval from the Federal Highway Administration. Because of the congestion on Loop 1, Deep Eddy has experienced increasing levels of cut-through traffic. We have asked the City Transportation Department to undertake a traffic study in that part of the neighborhood. With significant levels of cut-through traffic, all options need to be examined. That study is not yet underway. However, I am pleased to tell you that City Transportation staff has completed a study of the Balcones/Pecos/35th intersection. It has become increasingly problematic over the last few years as more and more cars have sought to bypass both Loop 1 and now even Exposition Boulevard. During peak hours, City staff found that there were more than 4,000 cars passing through that intersection. Engineers are reviewing the possibility for either all-way stop signs or traffic lights. Each has different technical thresholds. But the good news is that changes are imminent late this fall that will enhance both the safety of the Balcones/Pecos/35th intersection and will improve mobility for the neighborhood. The Austin City Council recently passed its 2012 budget. The budget includes significant increases in taxes and fees. If you have followed my comments on this subject before, I am firmly of the opinion that growth should pay for itself rather than being subsidized by stable urban neighborhoods. That said, the total budget is $2.8 billion, a staggering amount. The property tax rate will increase to 48.11 cents per $100 property evaluation. The approved budget includes funding for an additional 49 police officers and 18 Emergency Medical Services paramedics. It is worth noting again that the Austin Police Department alone drains the City of every single dollar of ad valorem taxes paid in Austin. I think that we all appreciate the fine work of our first responders and respect the challenges they face but we are curtailing other necessary and desirable City services because of the percentage of revenues they extract. Since 78703 pays roughly 10% of all ad valorem taxes, with the addition of these officers, we certainly will press for additional officers to be assigned to our neighborhood to combat ongoing petty crime. Austin Energy is anticipating its first rate increase in 17 years, and it won’t be insignificant. The projected 13% increase is under review but the effect on the average residential electric bill will be approximately $10 to $20. I suspect most of you aren’t average residential customers. Austin Energy is leveling the rate between residential customers and businesses, the latter of which have subsidized consumer rates for some time. I would point out that compared to peer cities, our rates are comparable nonetheless. There may be some movement at the Legislature during the next session that would attempt to deregulate the City of Austin’s monopoly. This could be devastating for the City since utility transfers support many of the City’s programs that we depend on. The result would be an even greater burden of taxes shifted to property owners. And deregulation hardly guarantees better rates. For more information, please go to: http://www.austinenergy.com/About%20Us/Newsroom/Press%20Releases/2011/rateProposalRelease.html As if electric rate increases weren’t enough, beginning Nov. 1, Austin Water Utility retail customers will pay a revenue stability fee that is based on meter size. The average residential customer will pay an additional $7.79 per month which includes all water fee increases. This is clearly being created to pay for growth. Whether you agreed or disagreed with Water Treatment Plant No. 4, you are paying for it. As I mentioned before, there has been no activity on the Brackenridge Tract. Board of Regents Chairman Powell sent a letter within the last year to Mayor Leffingwell offering to enter into discussions to terminate the Lions Municipal Golf Course lease before its 2019 termination date. As many of you know, the University of Texas has advised the City that it does not intend to renew the lease in 2019. We have urged Council not to have those discussions with the University and at this point, they have respected our request. Future Councils may not feel the same way. Many of you have not been involved in the Save Muny efforts over the years for whatever reason. You need to make yourself aware of the issues if you are not. You will find ample information at our website, www.WestAustinNG.com. We are always more than happy to answer any questions that you might have. It is a quiet period but that can always change and we must be prepared for thoughtful, deliberate conversations. The University has expressed an interest to monetize the land sooner and we have the desire to minimize the adverse impact that development will bring to the neighborhood. Many want to keep this vital urban green space open either as a golf course, open space, or mixed recreational space. Others might want to see some limited redevelopment of the course that is sensitive to the neighborhood. I believe that with creative thought and engagement by all and a commitment from the community, anything is possible. We will be posting a series of surveys in the coming months and your participation will provide us with guidance as we move forward with strategic planning on this issue. The Comprehensive Plan is in the news quite often these days. It is a critical for long term planning of Austin and the region. However, it has been poorly conceived and poorly executed by the City. We identified several concerns unique to the integration of our Central West Austin Combined Neighborhood Plan completed just last Fall with the Imagine Austin Comprehensive Plan (“Plan”), which have not been addressed to our satisfaction by staff, and concurrent with our belief and that of countless other citizens and stakeholders that the Plan process itself has been flawed from its inception. The West Austin Neighborhood Group strongly believes that a plan is critical to the long term economic and environmental viability of our region. However, without stakeholder buy-in, the Plan will serve as a focal point of mistrust rather than as an instrument of intelligent guidance. We and the rest of the Austin community want the Plan to be an extraordinary document that will shepherd us in the years and decades to come while respecting the integrity of our neighborhoods and enabling our citizens to thrive. The current draft is far from that. At this point, and given the enormous consequences for our region’s future, wisdom urges us to pause and consider carefully the product being brought forward and the very process that has driven it. As critical stakeholders, you must be engaged with this process because it will affect you. As I began to write this month’s President’s Message, I happened to open one I had written almost 2 years ago today. I was struck as I read through and noted that history indeed repeats itself. Frankly I don’t have a lot of news worth noting this month. On August 5th, 2009, the Austin City Council approved changes to our Local Historic District Ordinance. Contextually, landmarks work to preserve particular properties while local historic districts preserve the context of an area that can be as small as one block or far larger. I also noted that the perceived adverse impact on tax revenue for the City, County and school district as a result of the tax incentives tied to historic preservation were negligible. In fact, both local historic districts and individual landmarks benefit the City by lending stability to neighborhoods and property values as well as by driving tourism. There are studies that support this assertion. A year later, the City would initiate a sweeping review of the historic landmark program and the incentive structure. On Thursday, August 4, Council approved two resolutions that will make substantive changes to the administration of the landmark program and to the incentive structure. The City’s contribution to the historic incentive will be capped for all residential, owner occupied landmarks at $2,500 for all new designations and for existing landmarks as ownership changes. This gives the City, current owners and future owners certainty going forward. The incentive structure for commercial landmarks will not change. While there are other significant changes in the Council resolution, the final language will make it through staff and various boards and commissions before adoption. We’ll report to you further as the language is codified. This is a positive outcome for the community. A second issue that I addressed in August of 2009 was the weather. I noted the hope of the approach of the fall season, and with any luck, an end to the hottest, driest summer on record. Well, who knew that THIS would be the hottest driest, most miserable summer most of us have ever experienced. As I drive around the City, I see even the best maintained yards suffering. In fact, I even saw trees IN Shoal Creek turning brown. I want to reiterate that it is so important to protect your trees. A drive through West Austin reveals that many trees have died. Many of the rest are stressed. If you have ever lost a tree that shaded your house from the summer sun, you have seen your utility bills increase. Or your landscape has wilted with the unexpected change in light patterns. Hopefully the stressed trees will recover. In the meantime, remember to keep your trees watered. Not only will it keep them alive but it might help to minimize their current brittle state. The City arborist recommends watering one gallon per inch in trunk diameter every two weeks after the last significant rainfall. This winter, you may want to consider replacing some lost tree stock. We encourage you to diversify the types of trees in the neighborhood. Bryker Woods and Pemberton tend to have magnificent pecans and red oaks. Tarrytown is shaded by a preponderance of elms. Many of these trees, throughout our neighborhood, are reaching the end of their lifespan and need to be replaced for the benefit of future generations. As sad as it is to see the loss of part of our urban canopy, let’s look upon this as an opportunity to reforest our neighborhood. We are in the planning stages for the Annual Meeting and Social on Saturday, October 22. We have big plans so stay tuned! Cathy Kyle and Mike Cannatti are hard at work as we speak. Look at the date on your mailing label to see if your membership is current. While doing so, don’t forget to pass along your preferred email address to us! A growing percentage of WANG members now receive the newsletter via email. We certainly would encourage you to shift from a hard copy of this newsletter to an electronic edition. Don’t forget that your continuing support of WANG is never more critical than now. In addition to paying your dues by check, you can always renew your membership online at www.WestAustinNG.com.As I began to write this month’s President’s Message, I happened to open one I had written almost 2 years ago today. I was struck as I read through and noted that history indeed repeats itself. Frankly I don’t have a lot of news worth noting this month. We are in the planning stages for the Annual Meeting and Social on Saturday, October 22. We have big plans so stay tuned! Cathy Kyle and Mike Cannatti are hard at work as we speak. Our next regular meeting is Monday, September 12 at 7:00PM at the Howson Library so please mark your calendars. OK, the cat is now out of the bag. It is hot, it is sizzling, it is bone dry. Oh, that isn’t the cat that you want me to chat about. Could it be the Brackenridge Tract? Smooth segue….thank you. Cooper Robertson & Partner’s (“CR&P”) offerings were much like the weather, miserable. I, for one, was absolutely appalled though I can’t say that I was entirely shocked. For those of you who have not heard, CR&P came out with two suggested master plans that would result in between 12 million and 15 million square feet of development, including as many as 8,700 apartment units or nearly 30 times the size of the new Gables on Caesar Chavez and Lamar, 650,000 to 850,000 square feet of retail space and over 2 million square feet of commercial and office space, the latter the equivalent of nearly 4 Frost Bank Towers. All in the middle of a residential neighborhood in an ecologically sensitive area with severe traffic limitations. I have been asked time and again whether there is any hope. Sparing all the hyperbole, I do, firmly and adamantly, believe that there is hope. The master plans presented for adoption by the Regents, are in the opinion of a number of us, worst case scenarios. They are not feasible, sustainable or desirous. That being said, the road ahead is not going to be absent of enormous challenges. WANG has worked and will continue to work with, not against, the University, City and others. It is advantageous for all of us to work in cooperation, since we are all inextricably linked. The University would not be what it is without Austin, and Austin would not be what it is without the University. Alumni, faculty, donors, benefactors and students — not to mention Regents and Chancellors — live in West Austin. All are Austinites. Of course, many West Austinites are not associated with the University but obviously have a vested stake in what happens on the Brackenridge Tract. Finally, the Brackenridge Tract would not be the unique property it is without the value provided by our neighborhood. To date, neither in print nor in the hundreds of conversations I have had since, has there been one word, not one word, of support for these horrendous master plans. Time and again, I have heard that CR&P and it local team failed to learn from or listen to what we (and that would include an array of stakeholders) had to say. In my opinion, their work product evidences their failure to utilize invaluable input from the community. Consequently, WANG has called upon the University of Texas System Board of Regents to reject both master plans submitted by (CR&P). We are pleased that Chairman Huffines has expressed an earnest desire to continue dialogue on this sensitive matter. Of course, we are grateful that he stated resolutely that the leases to the City of Austin for Lions Municipal Golf Course and to the West Austin Youth Association for its youth sports and educational complex as well as the 1989 Brackenridge Tract agreement will be honored until their expiration in 2019. Neither the “Village Plan” nor the “Park Plan” propose truly sustainable redevelopment of the Brackenridge Tract in a manner that will benefit all while retaining and protecting the existing character of the surrounding core suburban community and its invaluable open space. Instead, it proposes residential densities as much as four (4) times that of the award winning Mueller Redevelopment. There are folks that don’t like the way Mueller was planned – but it did get national recognition – and it is just an example. Mueller is recovered industrial land or “brownfield” adjacent to two (2) major arterials, not parkland, “greenfield,” and lower density residential, retail, and academic tracts located in a residential neighborhood served by three (3) neighborhood collectors. The overall size, scale and thrust of the CR&P master plans are entirely inappropriate in proposing an incredibly massive mixed use, residential and commercial project. CR&P fails to address the overwhelming traffic problems that would be created by either Plan. Their traffic consultant said that there are lots of modes of transportation that can effectively move people within the redevelopment but they have no answer to moving people in and out of the area. I have said it before (and it bears repeating), their fixes don’t even address congestion now much less the thousands of car trips that would follow any development. Every single road in West Austin and every intersection will be gridlocked. Increasing capacity and shifting Stratford/Westlake traffic to Enfield is not a long term answer either. (The Old Enfield Neighborhood should be very concerned.) One of their consultants told me that things would work themselves out over time. That is NOT an answer. Any project that would involve MoPac would have to go through CAMPO, likely in the 2040 plan. It would have to be prioritized for funding and the funding then would have to be available. It could be many years or even decades before a true fix was financed and completed. That is not sustainable. Only CR&P’s planning staff can tell us how formulaic their process was in arriving at these plans. However the mantra of New Urbanism is touted by firms such as CR&P (and our neighborhood planning staff). Interestingly, one of New Urbanism’s precepts is that “development or redevelopment should respect historical patterns, precedents and boundaries.” There is absolutely nothing to suggest that CR&P heeded that precept in any shape, form or fashion. They falsely rationalize that this is a natural progression of the urban core. It is not! The Tract lies within a core suburban neighborhood. New Urbanism suggests that “infill development is intended to reclaim marginal and abandoned areas.” One could argue that this might apply at some level to the Colorado and Brackenridge Apartment tracts but it certainly doesn’t apply to the rest of the tract. “One underpinning of New Urbanism is the compatibility of building types with the same relative mass, height and architectural style, regardless of their uses, which may change over time.” It is challenging for me to see how masses of six story apartment complexes and a development with tens (?) of thousands of people is even remotely compatible in a built residential neighborhood. If one of the primary intents of New Urbanism is to conserve our natural environment, it is incomprehensible to me that an intensive redevelopment that would swallow all but 20% of the tract, much of which is now greenspace, to transform it into impervious cover in a critical and environmentally sensitive watershed, not to mention resulting in the removal of countless heritage trees, could even remotely be considered environmental stewardship. The Brackenridge Tract might lend itself to Green Urbanism, which encourages open space of more than 60%. It is clear that didn’t cross CR&P’s mind. And that is a shame. As we broil under these awful summer conditions, it is worth considering what a massive redevelopment will do to the West Austin environment. No matter how efficient the project might be, significantly higher levels of pollution can be expected, with all of the liabilities that ensue. With the prospective loss of greenspace and tree canopies and subsequent replacement replete with concrete, stucco and asphalt, the heat island effect will only be magnified. The Environmental Protection Agency says that the top solutions to mitigate the heat island effect are trees and vegetation – exactly what would be lost. It is more evident than ever that cities such as Austin are 1 to 10 degrees hotter than surrounding suburban areas. That is not sustainable. The net is that both plans lack compatibility with the adjacent core suburban neighborhood, are devoid of significant open space, lack deference to the distinguished history of the Tract, and are absent consideration of public sentiment. Both plans also fail to address the detrimental effect that the project would have on the reputation of The University of Texas at Austin. STAY TUNED FOR A BOLD NEW VISION! Now, more than ever, in the history of West Austin and WANG, is it critical that you renew your membership and encourage friends and neighbors to join WANG. If what I have underscored above isn’t enough to get you to call on your friends and write a meager $20 check ($10 for students and seniors) for dues, then West Austin may well be lost. Please go to our NEW website, www.WestaustinNG.com.